St Ives Scrub | Apricot, Green Tea, Coffee or Oatmeal; whic one you need? I’m sure you’re familiar with St. Ives scrubs, aren’t you? After all, the St. Ives Apricot Scrub has been always been a drugstore classic. First, ever scrub in my life was a jar of ST. Ives Apricot Scrub. I’m talking about the time a couple of decades back. That time there was no other scrub used to be seen in the Bangladeshi cosmetics stores but St. Ives. It’s good to see this Unilever product is still rocking the market with the same glory. Not same actually, the recent quality and product development of St. Ives facial scrubs are impressive. Have you had a chance to try out this new range of St Ives facial scrubs? I don’t use much of a physical exfoliator anymore for my face. But when I was sent these new bunch of St. Ives scrubs I had to give them a try. In the past, all I’ve tried is their original one so other five of the 6 is fairly very new to me. Gotta mention that I do like the new colorful packaging yet it’s the same good old ST. Ives formula. All these scrubs claim to be dermatologist tested, non-comedogenic (won’t clog pores), oil and paraben-free. According to St Ive’s says, these new scrubs are also eco-friendly (made with 100% natural exfoliants) and microbeads-free. This is a moderate level of physical face scrub. This St.Ives scrub for radiant skin has mandarin peel and lemon extract in it to help skin unveil its natural glow. I love how this radiant skin scrub smells, soothing and refreshing yet kinda familiar. This same fragrance I did notice in some soap (by Unilever of course) I believe. Anyhow, the scrub made it to my everyday shower-shelf products. I like a quick shower time exfoliation with this particular St Ives face scrub. This one reminds me of the very original St Ives Apricot Scrub. It smells the same and feels the same as far as I remember. The exfoliation level of this Fresh Skin Scrub is high. Thus I prefer using it mainly for my hands and legs. Hello, I love my hands and legs the same as my face! It’s all my body after all. This Acne control Apricot Scrub is oil free and with salicylic acid (2.o%) as an active ingredient. This face scrub promises to work as an acne treatment while giving you the scrub job. Although this is for acne prone skin, please do not use it if you have active acne on the skin. The scrubbing particle (walnut shell powder) is quite harsh in it to use it over even on the inflamed skin. The exfoliating fact is also mentioned in the packaging as ‘Deep’ exfoliation. It’s better you use this acne scrub when the acnes are dead. This Acne Control scrub really helps to get rid of the dead skin fast. As a result, the post acne spot fades away quickly leaving the glowing skin. If you know me then you know that coffee excites me anytime and anywhere! This blend of coffee and coconut smells delicious, however, this is ‘DEEP’ exfoliator, has walnut shell powder as the mail exfoliating particle. St.Ives Energizing Scrub also took place in my shower-care-shelf because I kinda prefer this sorta exfoliators [read my previous post about shower exfoliation ritual with coffee scrub] for my body, specifically legs. Among all 6 this is my top favorite. With its pleasing green color, this St Ives Green Tea face scrub has 1% salicylic acid as an active ingredient in it and it smells lovely. This Green Tea Scrub is a moderate level of exfoliator but it’s kind to the skin. I love how it removes the dead cell and reveals clear skin. I do not have blackheads on my face so I’m not sure how it’ll help on that but I guess it will with regular use of this scrub. This is a 2-in-1 product. The mildest of all 6 St. Ives scrub and also works as a face mask. An Oatmeal face mask is the first thing I opt for when my skin acts sensitive. Oatmeal somehow is incredibly amazing to calm down skin irritation. I’ve been using this St.Ives Gentle Smoothing scrub as a mask only because I like it more this way. As a mask, this revived dry skin fast and my skin does look kinda brighter afterward. St. Ives, Founded in 1980, St. Ives is widely-acclaimed and number one scrub brand in the USA, with big market share across regions worldwide. St Ives believes the most powerful ingredients can’t be created in a lab. In formulating the products, St. Ives uses the most effective and fresh ingredients sourced from nature – with no unnecessary chemicals. 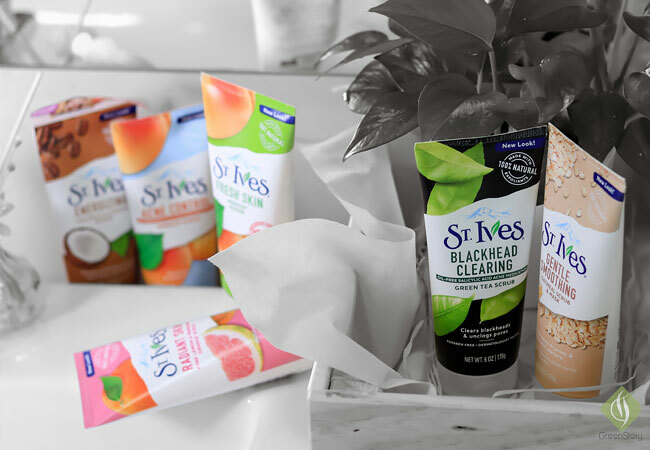 St. Ives offers to meet the needs of target consumers who are feminine and grounded optimists and who enjoy nature as well as its natural products. Inspired by nature, the formulas are made with 100% natural exfoliants, moisturizers, and extracts for healthy-looking, radiant skin. St. Ives is committed to bringing an enjoyable skincare experience, with formulas that smell great, feels nice on the skin, and leaves a fresh feeling. St. Ives is Fresh. Better. Naturally. More information visit St. Ives website. Have you tried any of the St Ives face scrub? Any favorite you spot here? – The full range of St. Ives face scrubs are available pretty much everywhere in Malaysia. – These faced scrubs retail for RM 24.90 and one tube contains 170g of products. i use this already, its help my skin very well..